If you are looking for the best ATV oil on the market right now, you’re on the right page. One of the hurdles you have to go through as an ATV owner is to get the best oil for your machine. If you have bought one in the past, you obviously have a brand you already like. However, if this is your first time, you need some guidance in choosing a brand you can stick with. This is important because each brand has flagship oils that are only suitable for a specific kind of ATV engine. Any knowledgeable motor vehicle enthusiast out there will agree with me that each type of vehicle goes well with a certain type of engine oil. The unmistakable and much loved ATV is no exception here. Actually, an ATV’s extreme nature demands that the owner offers it the best oil he/she can get. Talk about the high torque and loads, wet clutch system or the adverse environments you will find ATVs operating. There are no two ways about it. You’ve got to get your ATV the best performance engine oil in the market. How do you even know which oil is best? Well, this is where you leave guys like me to do the searching and recommending. Enough with the office talk, lets hit the market! I have personally checked out these ATV oils, and I know what they can do for you. Choosing the best oil for ATV engines shouldn’t be difficult after going through this guide. There are many aspects to shopping for the best ATV oils. It’s not just about choosing the oil, but more about choosing the right one for your machine. That’s why it’s important to know the specific type of oil you are looking for. You could be looking for oil for your Honda ATV or synthetic oil for your ATV or the best oil for wet clutch applications. If you still are not sure, don’t worry. You will find the most important types here and no matter what model/brand of ATV you have, you should get a suitable one through one of these. When you are buying engine oil for your Honda ATV, you want to make sure you are getting the right one. If you look out there, you’ll quickly discover there are thousands of engine oil you can use for your machine but are they all worth it? I’m afraid only a few made the cut. 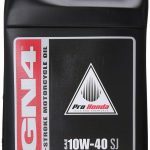 The most popular engine oil that owners of the Honda ATV unanimously use is the Honda GN4 oil. Ask any Honda ATV owner for a recommendation and you’ll be pointed to this brand. It’s the best oil for wet clutches, period! Honda’s success with the GN4 can be traced as far back as 1975. Over the years, advances in research and technology allowed the company to engineer a special additive to its oil that serves the unique needs of ATV engines. The Honda Pro GN4 offers better shear resistance, cleanliness and viscosity stability. Such qualities have been achieved after repeated testing and improvements on countless Honda products. The Honda Pro GN4 Motor Oil is engineered to reduce the possibility of foaming. At a viscosity index of 10W-40, this oil has extraordinary stability regardless of whichever temperature you use your ATV in. It combines all the sought after qualities of a universal oil that can be used not only in all Honda powersport motors, but also many other products in the ATV bracket. This motor oil’s lubricity and high yield potential exceed most of its peers, including highly competitive synthetic brands. In addition, the price of this oil is affordable. If you love the exhilaration of driving and moving smoothly on your four-wheeler, you need an engine oil that will agree with your ambitions. This oil flows fast and minimizes the internal engine friction, and it’ll match running at high RPM as well as enhance your ATV’s speed. 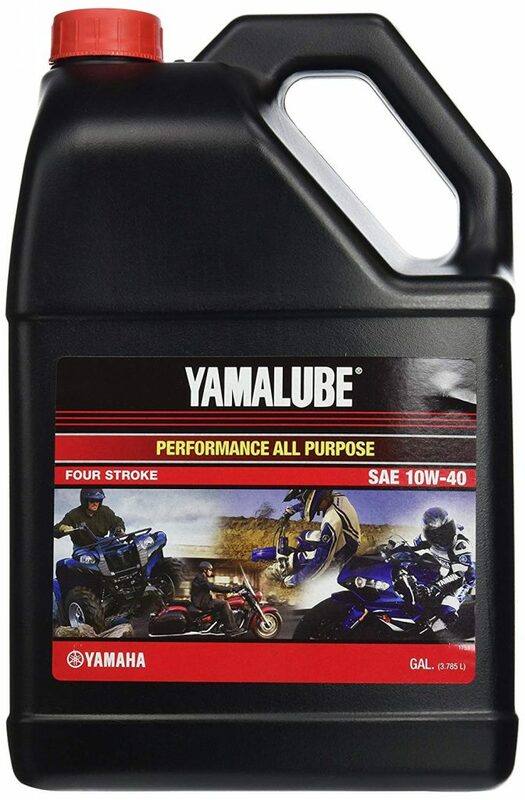 This synthetic engine oil is designed to be used with all 4-stroke motorcycles and ATVs and owners who are looking for a high-performance lubricant. The beauty of this synthetic oil is that it helps your machine run cooler and helps the shifts become smoother. 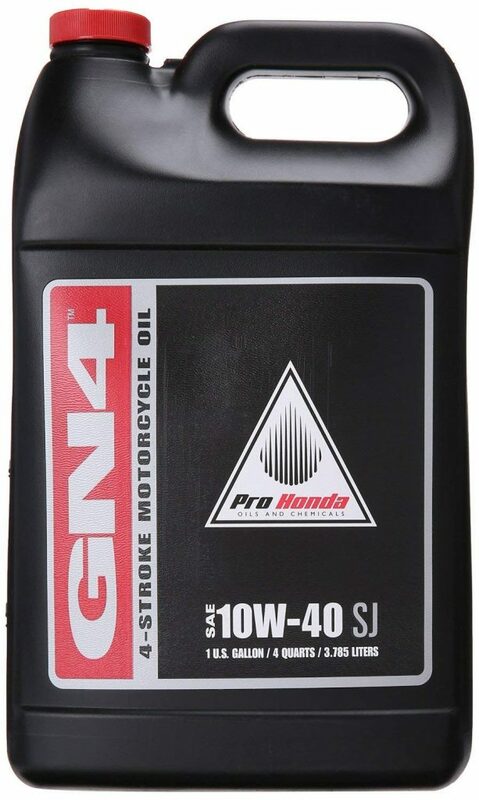 Also, if you are not able to afford the Honda GN4 oil (it’s our #1 recommendation but expensive), this will serve as a great alternative for you. Not only is it produced by a reputable brand, but it’s also proven as a great oil for those who want to go many miles without experiencing hiccups. When you are buying an engine oil for your ATV, you most likely want to get the oil that’s the best suited for your machine. In this case, you need an oil that can protect the wet clutch on your machine so it can last longer. There are many brands on the market, but you don’t have to go looking for them – that will take thousands of minute to get down to the right one. Designed for heavy duty ATV and UTV models, this oil is an excellent choice for people who are worried about finding the best maintenance and performance engine oil. Some of the benefits include engine protection even under the most extreme weather conditions, maintenance, and protection of ATV and UTV wet clutch systems while providing highest possible power transfer, preventing the formation of deposit while creating room for the attainment of maximum horsepower. The Valvoline 4 Stroke AV Motor Oil also minimizes wear and tear, as well as the occasional corrosion experienced with some poor quality engine oils. This oil is a product of a rich mixture of premium base oils that have also been enriched with rare additives to bring the best out of your ATV in performance. 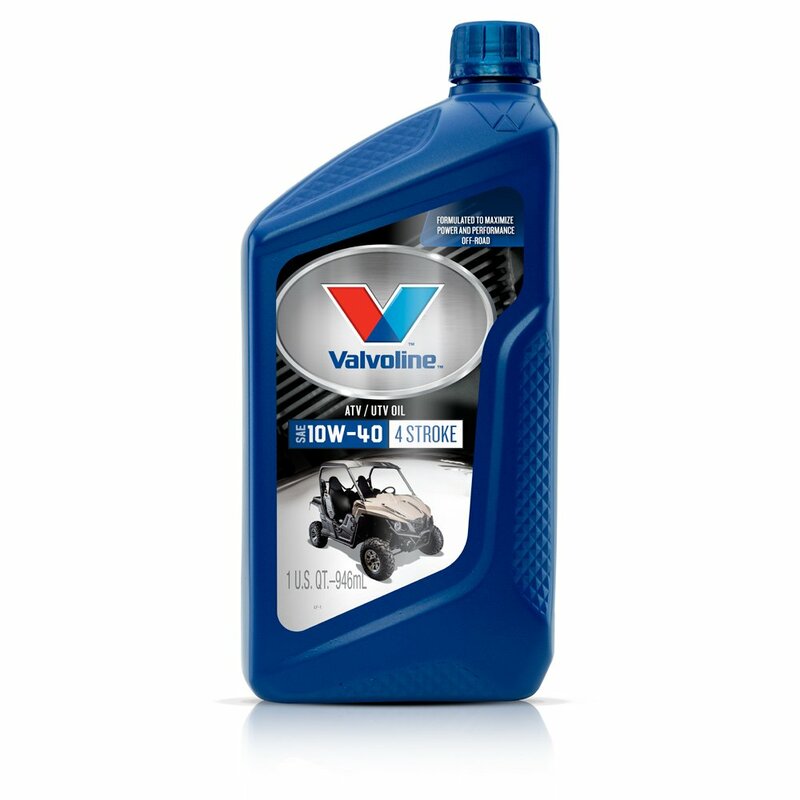 If you are looking for an oil that will help keep your engine healthy for the longest time, Valvoline 4 Stroke ATV Motor Oil is the sure way to go. Manufactured using the best quality mineral base stocks, this oil is recommended for ATVs, motorcycles, as well as scooters. 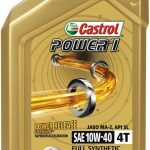 The JASO MA rating on this ATV oil means that it does not contain friction modifiers. Not many of its competitors can match up with this quality standard. Yamalube oil products are specially designed to provide film strength that is essential in protecting an engine while keeping wear and tear at bay. It is best suited for use in wet clutch systems and non-segregated engine layouts having been enabled with stable clutch performance characteristics. As its name goes, this oil is recommended due to its anti-frictional capabilities. With a viscosity index of 10W-40, it is ideal for most engines. It does not matter what variant your ATV is, Yamalube All Purpose oil has the best configuration for your needs. 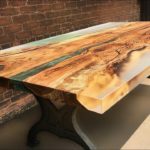 The price tag on this product is within the industry’s average, and you can order it online today. When shopping for synthetic oil for your ATV, it’s important to choose the full synthetic oil version as that will give you the full benefits of the oil. Moreover, synthetic oils don’t break down like mineral oils. And while they might cost more, you get the benefits of a stronger and more efficient engine. 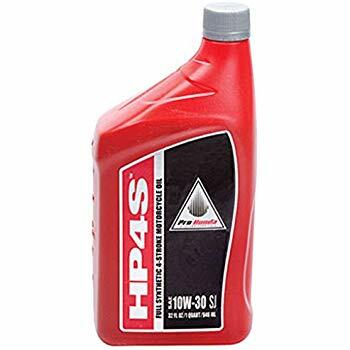 The Honda Pro HP4S Full Synthetic Oil comes in a 30 oz package and is suitable for all four wheelers. It offers lower friction than most conventional oils as well as better oxidation resistance, both of which are important for high heat performance and loads. 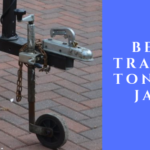 This is a great option if you work with your ATV all year round. The less frictional drag also makes it easier to get maximum power with this oil. The oil is suitable for ATV machines with wet clutch transmissions and meets the minimum requirements for quality standards. Moreover, it doesn’t break down like mineral oils, so your engine gets superior protection for longer periods and during high temperatures. The oil has a good distributing power, which is important for getting the proper flow to vital parts of your machine. 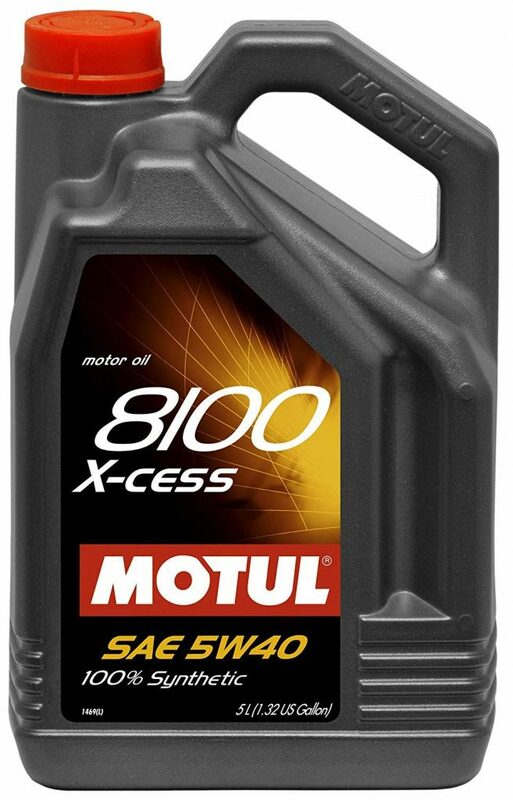 Also, if you have a 2006 ATV or a newer model, this oil is specifically approved for your machine. The Rotella Synthetic Motor Oil is one of the popular ATV oils out there. 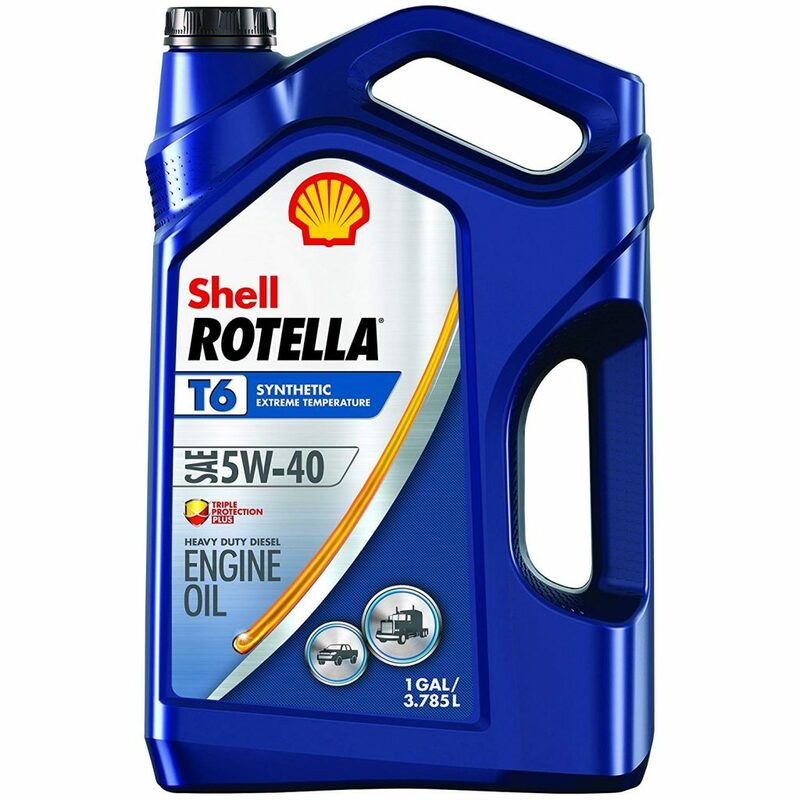 One of the strong points of this Rotella oil is the fuel economy. It’s able to reduce fuel consumption by up to 1.5% while still providing excellent protection for your engine. This helps you save money in fuel consumption without compromising durability. 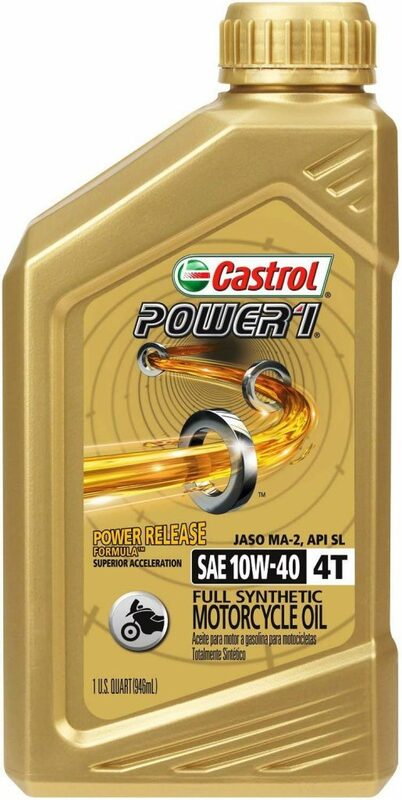 Compared to the previous generations of API CJ-4 engine oils, this brand provides better engine protect that’s important if you want to reduce wear and tear on the engine. It’s also compatible with most exhaust emissions control systems, something may not find in other products on the market. It helps preserve oil and prevents excessive loss of oil during oil changes. Moreover, it is compatible with most exhaust emissions control systems. This brand prevents excessive loss of oil during oil changes and it’s thicker than competing oil. And because it’s thicker, it doesn’t burn off as quickly. It has the JASO-MA label on it, which means that you can use it for your wet clutch ATV machine. Another advantage of this oil is that it maintains an excellent condition per miles covered compared to other popular engine oils. Finally, compared to other top engine oils, it’s less expensive and is easier to change at 5000 miles or more. If you have a car with a high displacement engine, catalytic converter or Turbo Diesel, you want this. The oil’s multi-purpose nature makes it a decent brand to choose for cars that are still under warranty. And you can peer it with leaded or unleaded gasoline or use it for LPG/diesel fuels. Moreover, the oil is 100% synthetic, which means it doesn’t contain any crude oil. For this reason, you can expect superior mechanical performance when you use this compared to using conventional motor oil. Aside from being fully synthetic, the oil has a viscosity rating of 5 in cold temperature and 40 at normal operating temperature, making it a good option if you are looking for improved gas mileage or reduced engine wear at extreme temperature. It meets the VW 502 standards, making it one of the best oils for high-performance cars. Also, this is why it’s accepted by several auto-makers as a great replacement for the OEM oil. It should be noted that this oil will cost more than the conventional motor oil because of its complex method used in producing it. Not surprisingly though, most fully synthetic oils tend to be expensive. If you are looking for the highest quality oil for your ATV, then this is a good option to consider. Choosing an engine oil for your Polaris ATV is not that difficult. Like most brands like Honda, Polaris also produce engine oils for their ATV. As long as you are getting the oil from the manufacturer of your ATV, you can be sure that you are getting the recommended oil for your machine. 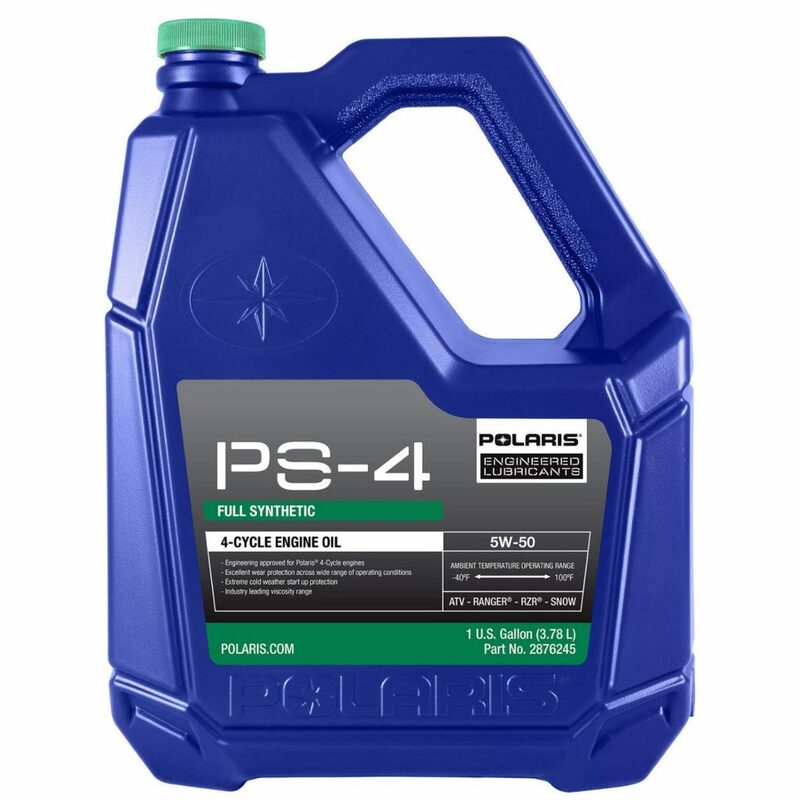 The Polaris Factory ATV & Snowmobile 4-Cycle Synthetic Oil is the best oil for your Polaris 4-cycle engine. It has the capability to protect your engine in both cold and hot condition and also provides easy starting of the engine in extreme cold. 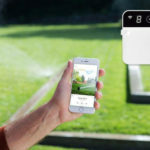 You can use it in different weather conditions ranging from -35 to 100 degree, which makes it great for those that work all year round. It promotes longer gear and clutch life while also protecting your inner of your engine from rust and corrosion. It’s 100% synthetic oil. So, if you are looking at maintaining a recommended oil from Polaris but also want to use synthetic oil, this is a great option for you. Although it’s a bit pricey, you can get this in great price if you buy in bulk. Sometimes buying Polaris kits or individual quarts costs a fortune. If you have read so far in this article, you will agree with me that oil is an important component of your vehicle. It plays an important role in keeping your vehicle active and efficient in performance. That is the reason we carefully selected these diverse number of ATV oil so you can choose the right one. Always bear in mind that as the brands of these oils are different, so is their specific makeup. Therefore make sure that you make your decision according to your convenience and comfortability. In summation, I would like to remind you that you don’t have to always settle for less when it comes to caring for your ATV. If you want the best out of it, give it your best. Even if you don’t really know the specific type of oil you are looking for, this guide should help you choose one. You don’t need to have decades of experience to choose the best ATV oil for your machine.